Using various Fur Material Settings and Fur Console Variables, the fur shader can give your furry entities realistic highlights, dynamic shadows, responsive movement, and much more. 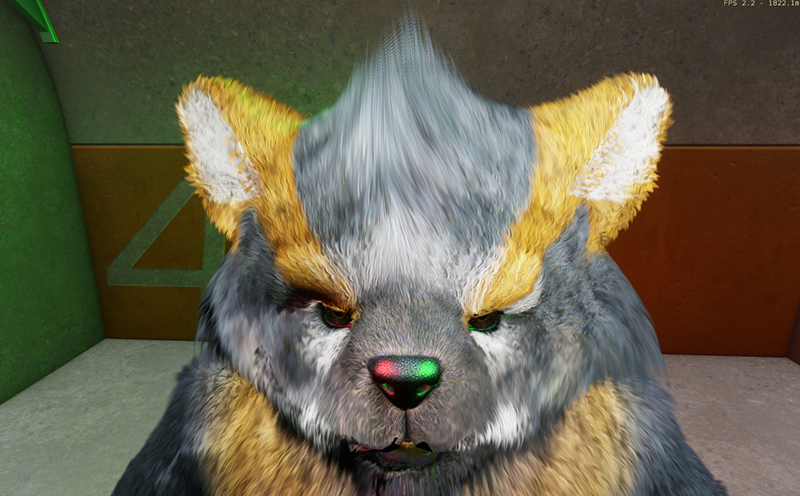 Anisotropic specular highlights are supported when a mesh provides fur combing data. This feature creates highlights that appear "banded" in the direction perpendicular to the fur strands. Notice the banded highlight from the green light on the bear's fur. Anisotropic highlights are not applied to areas where fur length is set to 0 in the mesh vertex color. For example, non-furry areas such as a nose, mouth, or claws will display isotropic, or hotspot, highlights rather than banded, or anisotropic highlights. The fur shader simulates subsurface scattering around silhouette edges of the fur, where less inscattering and absorption occurs. This results in a glow effect when the fur is backlit. You can tune this feature by adjusting the material parameters SSS Strength and SSS Falloff. To simulate the self-shadowing effect of fur, you can set a blend color or blend layer. To do this, you can enable Fur Blendlayer or Fur Blend color. If both are enabled, only Fur Blendlayer is used. You then set the color using the Fur Self Shadowing Color property. This value is interpolated with the default diffuse texture, where self-shadowing is stronger toward the mesh surface. The following image shows a furry sphere with no self-shadowing (1), the same sphere with fur blend color (2), and again with fur blendlayer (3). You can adjust the interpolation speed by modifying the material parameter Fur Self Shadowing Bias. When fur casts a shadow, it adds definition to the silhouette. If fur is not set to cast a shadow, then you would see a smooth edge of the structure that the fur covers. In the following image, you can see the shadow of the bear's fur on the wall. Fur can contribute to shadow passes, including bending caused by wind. Fur is alpha-tested in shadow passes. You can adjust this by modifying the material parameter Fur Fins Alpha Test. You can also turn on fur in shadows by toggling the console variable r_furfinshadowpass.